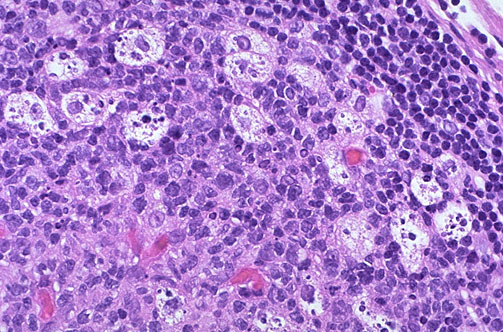 At high magnification, the germinal center in this reactive lymph node follicle has prominent macrophages with irregular cellular debris (so-called "tingible body macrophages"). These macrophages are processing antigen to pass to lymphocytes to stimulate specific immune responses. Antigen can be brought to the node via lymphatics or via bloodstream. Specific clones of lymphocytes are attracted to and migrate through to their respective antigens via high endothelial cells of venules.